I love the uniformity of rotary telephones from the 50’s thru the 70’s. They had the same exact shape for years. Different colors would come out but there was really only one style. I have almost all of the colors in that same style except pink…. (just so you all know whomever is reading this and wants to know what to get me for my birthday…….. This morning, my neighbor two doors down, Brian sent me some links of overwhelming pleasing rotary telephone art. I almost exploded with smiles. The fact that they have this many of the exact same telephone just is terribly pleasing. The artist is Rune Guneriussen. and I am gathering this person is from Norway… There are many other cool shots on this site so check it out…. What really happened when I saw this is that I got a hankering for a phone from Norway… just like these. AND I really wanted my telephones to be shot as little pieces of art…. In the meantime, I was reminded of the photos I took the other day testing out a semi broken 35mm camera… here is one of my phones. It’s not foreign, but since you can’t tell from the black and white photo, it’s a tiffany blue princess phone. I love it….. This entry was posted in art, photography and tagged rotary telephones on February 25, 2009 by tinypine. Is it post-modern to blog about a blog about Tiny Pine? My friend and one of my favoritest picture-makers Gia Canali has a blog and she just interviewed me a couple of days ago for it. I thought it would be fun to link to the blog because that would maybe become a blog vortex of clicking and no one would ever leave! yay! I was a little surprised when I read back over my answers in some spots… particularly the Ugly Betty comments – you will have to read her blog to know what I am referring to – because I had just seen an episode a couple of days before and I felt maybe that I was misinformed about soy inks, or that the writers didn’t research very well… I think it was the latter. I loved talking about Verdie, my press, and I think I come off a little more chatty than I am on this blog about myself…. if you can imagine that. It’s easier sometimes to answer questions than to just make up what you want to say……..
Anyways…. I am so glad she decided to feature me in her blog…. I will do the same for my fraternal twin… Gia Canali is great. take a look at her site! 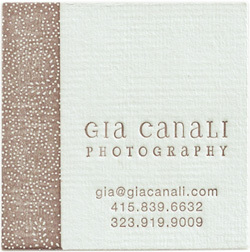 This entry was posted in art, family, invitations, paper, photography, printing, Uncategorized, wedding invitations and tagged Gia Canali, Letterpress, printing, soy based ink, wedding invitations on February 18, 2009 by tinypine. Love letters are probably why I am in this business. I am sentimental and romantic and when someone puts love into a scrap of paper, whether it is only friendly or something more, I cherish it. Words, images, craftiness. I have a little box where I keep these little things… paper pieces from old romances – letters, postcards and notes. I think I have a piece of paper where an old flame had mailed something to me…. I cut my address out of the box, like when you have to send in the UPC seal of a product. I have that little memory of a thought. So, it’s Valentines Day tomorrow, and all the little romantic bits of me are getting drummed up… That paragraph above is a perfect example! And all I can think about is writing love letters. It’s almost worth it to be far away from the person you love so you could send and receive love by post…. What’s so nice is that the words are very permanent and tangible. And then you can put them in a little box and one day someone will find them and isn’t that just romantic? 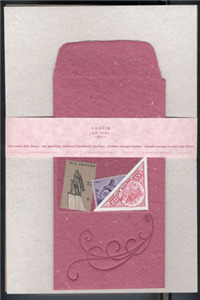 When I was working at soolip as a designer, we created a product with the perfect, I mean PERFECT love letter materials. I helped design it. It really has everything you need except a pen and nice thoughts. It has onionskin paper – which is not being made anymore – a handmade and printed shimmery and soft Dirty Byrd envelope (one of my bestest friends) AND one of my favorite things of all times…. Vintage Stamps. You can order them from soolip.com, but really, you don’t need this kit to tell someone how much you care… so in lieu of time, get out a sticky note, a legal pad or the back of a bill and let them know! If you haven’t posted your letter by the time you are reading this, you may be late and there may be an slightly sad or annoyed valentine on the other end…. so you better give that person some chocolates too… along with your love letter! This entry was posted in art, invitations, paper, postage, Uncategorized and tagged letters, soolip, stamps, valentine's day on February 13, 2009 by tinypine. In the past couple of weeks there has been LOTS of change at Tiny Pine Press because I moved my studio across town, from a becoming over-crowded space to a shared studio with lots more privacy, without shutting down production and even squeezing in jury duty throwing a baby shower for one of my best friends (who had her baby today!! and I got to be in the room for the birth shooting video and photos). She faired just fine, and I placed Verdie into her new home. I tested her out sans ink to make sure nothing shifted somehow – she IS held together by bolts. OLD bolts – and then I left her. She has a room with a view out the window in this new place. She has her own room. It’s sort of small but she is small (only 200 lbs.) She sits on her tiny table made of pine and just waits for me. Tomorrow I am making the final move…. Putting all the computery things in the big office space section of the studio, and I am going to print 3 runs on Verdie and see how she likes her new space. I think she does… there is a little window that lets in a good amount of light and it is quite cozy in there with everything in reachable distance. Here’s a picture of my little press, in her new space… Doesn’t she look so happy?? This entry was posted in invitations, printing, Uncategorized and tagged Jennifer Parsons, Letterpress, printing, tiny pine, vintage on February 3, 2009 by tinypine.